What we need to say upfront is that bell ringing is first and foremost: fun! Bell ringers are a friendly lot, and there is a very social aspect to ringing – whether it be organised outings to visit different towers, or the regular pub fixture after ringing practice. Bell ringing is a team activity that stimulates the brain and helps keep you fit (especially climbing some of those tower steps!) and it also makes a glorious sound! Many consider ringing to be their contribution to church life although, interestingly, until Victorian times bell ringing was quite separate from the Church. 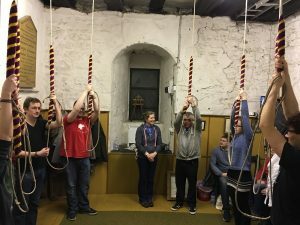 Others think of bell ringing as an art, or a sport, or a mental challenge – or indeed all of these, and they do it for the pure pleasure and the company it brings. 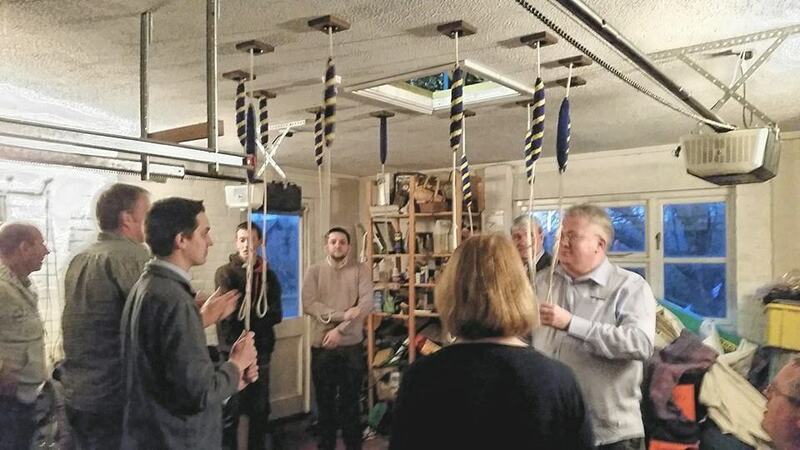 Bell ringers will ring for Church services and for special occasions such as weddings and funerals, and they will also ring to test their stamina and mental and technical skills by performing longer pieces of ringing as a personal and team challenge. We will acknowledge when people ‘score a first’ of something special, and this will often appear online as well as in The Ringing World, the weekly magazine for bell ringers. Ringers come from all walks of life and generally range in age from ten to those in their eighties. We take our child safeguarding seriously, and so this wonderfully inclusive activity is truly open to all ages. 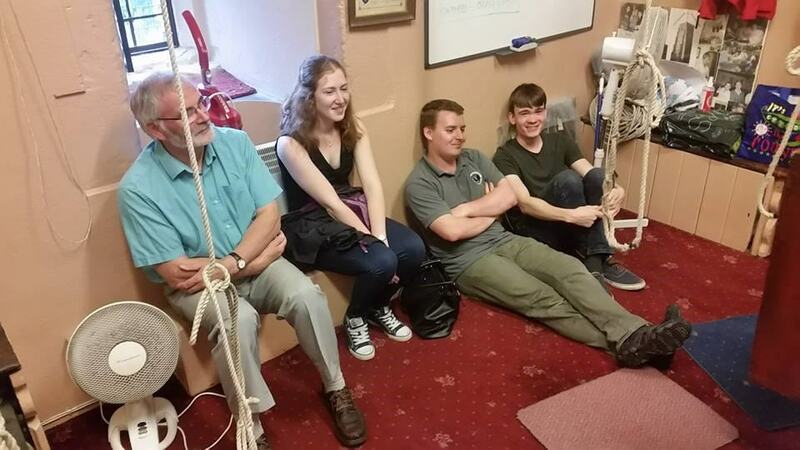 Many different societies have been formed, bringing together people from the same geographies or similar interests – all of them being pretty much an excuse to do more ringing! Ringing is well within the capabilities of most people. The initial learning takes several weeks, after which you can begin to ring with the rest of the band (that’s what we call a team of people who ring together). Most ringers practise once or twice a week and ring before or after church service on Sunday. Listen for the bells at a church near you or register on our Learn to Ring website, so we can find a tower in your area. Then go along and see what ringing is all about. The origins of change ringing lie in the sixteenth century when church bells began to be fitted with a full wheel. This gave ringers control of their bell, allowing sets of bells (rings) to be rung in continuously changing patterns. To really grasp this someone can talk you through it, often by demonstrating with a small model. 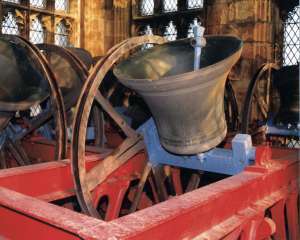 The most familiar sound to a newcomer is probably that of ‘rounds’ where the bells are rung in order, smallest (highest sounding) to largest. Have a look at this being done here. Music is then created by altering the order in which the bells sound. Physically this is done by the bells swapping places, ie one ringer waits a bit longer before pulling their rope to make the bell chime, whilst the person they are swapping with pulls earlier to get ahead of them. This is done either by someone calling out the numbers of the bells to swap them, or by learning defined sequences of changes called methods. 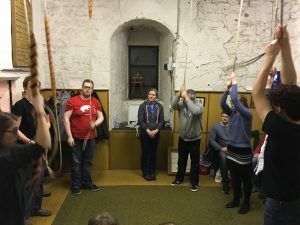 Learning a few simple methods allows ringers to join in with other bands in towers around the world. This is what goes on above the ringers’ heads, sometimes a storey or two above. The ‘clapper’ hits the side of the bell to make the sound. The wheel is controlling the movement of the bell, with the ringer controlling the wheel through pulling their rope. For more information on this website about ringing, take a look at Change ringing overview, Learn to ring!, Ringing centres, and Things to ring for. Also, if you have some time, look at the Craft of Bellringing – you can watch the whole thing, which covers the history as well as how ringing actually works mechanically, or dip in and out according to the chapters you are interested in! Where to ring (Dove) can help you find a tower You can also find out about the role of our Education committee here and don’t hesitate to contact us, as people will want to help you if you have queries!